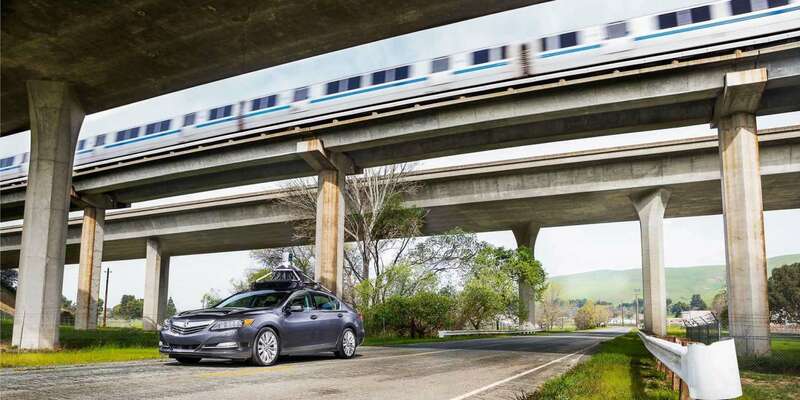 An autonomous car on a test run at the GoMentum Station testing facility in Concord. Image via GoMentum Station. Depending on who you talk to, the introduction of autonomous vehicles (AVs) into daily life could be a panacea (no traffic and more free time!) or endlessly fraught with problems (hacked cars and total system failure). The breadth of the possibilities, and the depth of the unknowns, have made the public conversation about AVs hard to navigate. SPUR is in the business of planning and strategy for cities and regions — not the business of predicting the future. We can’t know which scenarios will emerge; instead it’s our job to look at many possible futures and help figure out how to best plan for and shape them. As part of the SPUR Regional Strategy, we have launched research on the future transportation system in the Bay Area. In advance of our policy recommendations, this article lays out some of the ways AVs could manifest in cities. In a follow-up article, we’ll explore the opportunities we see emerging from the public discussion about AVs and future transportation. Despite their prominence in media coverage and transportation conversations, we don’t actually know that AVs are inevitable. We do not yet have proof that they are safe, feasible or desirable for our communities, nor that they will bring some of the advances being promised, such as greater safety, less traffic, fewer regulations and fewer public subsidies. On the contrary, if we don’t exercise caution, the results for the public could be much worse than the transportation system we have today. With vehicle automation, we become participants in something very complicated: AVs will rely on an extraordinarily complex web of systems: algorithms, hardware, communications, locationing and mapping, dispatching, infrastructure, smartphones or other hailing devices — incomparably more intricate and centralized than today’s auto system. Getting all of these details right — and making sure they don’t create the kind of unintended consequences that the automobile brought to cities in the 20th century — requires us to proceed thoughtfully. Manufacturers might sell vehicles to individuals, other companies might sell rides or sell advertising, and some might sell fleets of vehicles to other companies or the government to operate. It’s possible that the majority of people might shift from paying for vehicles and insurance to paying for each ride or mile driven. Who would control consumer prices and the availability of shared autonomous vehicles is a critical decision. The transition to AVs will most likely be gradual. For the next 10, 20 or maybe 30 years we might contend with a mix of autonomous and non-autonomous vehicles on the road at the same time. While we already have some automated vehicles testing on streets, and the California Department of Motor Vehicles just permitted testing on cars that can be steered remotely, it will likely be a generation (or more) before all miles driven are fully autonomous — if such a scenario occurs at all. Replacing all driving with AVs is no small feat: Bay Area residents drive 172 million miles a day. A mix of ownership models. There are two general ways to deploy AVs: as fleets of vehicles run by a single owner/operator or under the traditional model of private car ownership. We don’t know if fleets would be run by a monopoly or a few players, nor how government would be in the game, nor what the transportation regulatory framework would need to look like. In the single-owner model, many people would own their own AVs but could rent them to other people using a real-time app. Automated buses could dramatically change the cost structure of transit, enabling extremely frequent service and allowing for a broad range of vehicle sizes. However, automated buses are not nearly as far along in development as autonomous cars, and the implications for the transit workforce would be substantial. Autonomous rail transit is commonplace in the subway systems of countries including Japan, France and Brazil, and it’s growing worldwide. Autonomous 12-passenger shuttles are under testing in the Bay Area on college and corporate campuses. (GoMentum Station in Concord is one of the largest AV test facilities in the country.) These could be precursors to larger buses. Autonomous drone, robot and van delivery. Some in the AV industry suggest that drones (unpersonned aerial vehicles that carry goods) and flying cars (vertical takeoff and landing aircraft that carry people) might be adopted for mainstream use in advance of automobile automation. As we have learned from early test results, sidewalk delivery robots are a source of conflict on busy sidewalks, but for much of the region they could be a practical way to get goods to people. Also under development are robots that function like shopping carts, carrying your goods while you walk, and a range of AVs for specific retail uses, such as an automated pizza delivery truck. As a major freight center, the Bay Area will be an interchange point for transferring goods from autonomous long-haul trucks to human-driven short-haul trucks, similar to how rail and trucks operate together today. If autonomous trucks are useful, we might start to repurpose the shopping centers of the 20th century for the logistics centers of the 21st. As with autonomous transit, the implications and opportunities for the trucking and logistics workforce are significant. Interactions with people on streets. Among the safety measures proposed by car companies are RFID tags for bike helmets and sensors to be worn by pedestrians. If keeping people safe means putting the responsibility on them (or worse, criminalizing the acts of walking and biking), then we need to think twice about the technology. This was perhaps the worst outcome of 20th century auto-mobility: a pervasive mental model in which people must manage themselves around lethal machines on the streets. AVs should be held to a safety standard; the technology must be able to interact safely and predictably with people who are biking, walking and taking transit. In the long run, AVs may hold the potential to save lives — even if the vehicles aren’t perfect when they hit the road — and they should reach a far higher safety standard than human-powered cars. In 2017, for the second year in a row, nearly 6,000 people were killed while walking in the U.S.
For now, one thing is sure: Long before they hit the streets, AVs are holding up a mirror to the way we organize and operate transportation in the Bay Area. As the AV conversation continues, the issues that keep coming up are primarily the challenges we already face. We have accepted, for example, that our roads and streets are extremely dangerous and hostile places: More than 33,000 traffic crashes resulted in fatalities or injuries in 2016 alone. We have spread our communities out, forcing people to drive in order to get where they need to go. We have inadequately managed car congestion, reaching record levels of delay for the fourth year in a row. And we continue to provide, for the most part, mediocre public transit experiences. We can and should address all of these issues — either with AVs or without them. Our next article in this series will look at strategies for doing just that.